A.J.J. 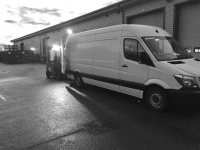 Courier Service is a established courier / light haulage provider based in Bodmin with a wide range of customers across the South West and UK where we have secured yearly contracts and daily regular runs due to our excellent and dedicated service we provide to all our customers. AJJ Courier Service is part of the courier exchange network where we can arrange for a courier to collect from anywhere in the UK at short notice and then deliver your items direct. All couriers used are fully insured and we are able to track them from collection right through to delivery. NEW SERVICE - Storage for all your goods on a price per pallet per week basis.. When tomorrow is to late and you need to get your goods to a customer ASAP please contact us for a FREE quote .